Staff Selection Commission had published the advertisement for the Scientific Assistant posts. Aspirants whose desire is to work for the SSC can utilize this opportunity. Eligible candidates must submit the applications through Online Mode. The Applications for SSC Scientific Assistant Recruitment 2017 started on 18th July 2017. Interested candidates check the eligibility details @ssc.nic.in and submit the online application forms before the last date 4th August 2017. This time we www.entranceexams.io has come up with the latest Employment News of Staff Selection Commission. 1102 Scientific Assistant Vacancies are available under SSC. Aspirants who had completed their Bachelors Degree in respective fields can apply for SSC Scientific Assistant Jobs 2017. The Board authorities will receive the online application forms from the eligible candidates until the last date 4th August 2017. First of all, we advise the job hunters to look the official advertisement to know the eligibility details to apply for the SSSC Metereology Department Group B Recruitment 2017. The SSC Board is looking for the talented candidates for the Scientific Asst Posts for its organization. So, it will conduct the recruitment test for all the applicants to filter the brilliant aspirants among them. Aspirants who are looking for the Govt jobs grab this brilliant chance and apply for the SSC 1102 Scientific Asst Jobs 2017. Moreover, know the complete details regarding the education, age limit, application fee in the below sections. Under the eligibility criteria, we are giving the detailed information of the educational qualification and age limit for the Scientific Asst posts. Aspirants have a look at this information, before starting the SSC Scientific Assistant Online Application process. Aspirants must have Bachelor’s Degree in Science (with physics as mandatory subject) / Computer Science/ Information Technology/ Computer Applications. Or Applier needs to hold Diploma in Electronics and Telecommunication Engineering, as on 04 August. As on 4th August 2017 applicants, age should not exceed 30 years. Applicants of SSC Scientific Assistant Recruitment must face the rounds conducted by the higher authorities of Staff Selection Commission. SSC Group B jobs selected candidates will receive a high pay scale as given the official notification. Salary For Scientific Assistant: Rs.33,000 – 36,000 / month. For General Category Candidates: Rs 100/-. Application Fee must be paid through SBI challan or SBI net banking. How to Apply online for 1102 SSC Scientific Assistant Recruitment 2017? Go to the official website of Staff Selection Commission ssc.nic.in. On the home page click on the Scientific Assistant In India Meteorology Department Recruitment 2017. Read the official notification of SSC 1102 Scientific Asst Jobs carefully. Enter the details like name, age, qualification and other in the application form. Then upload the scanned documents and passport size photograph. Pay the application fee as per the category is given in the SSC Official advertisement. Then, click on the submit button. The application process completed. Finally, take the printout of the Staff Selection Commission Scientific Asst Application forms for futures use. Hope that the information of Scientific Asst jobs of SSC given here will be helpful for all the job seekers. Keep visiting our site www.entranceexams.io for the latest updates on SSC jobs, exam and Govt Jobs. If have any doubts comment in the below comment box. 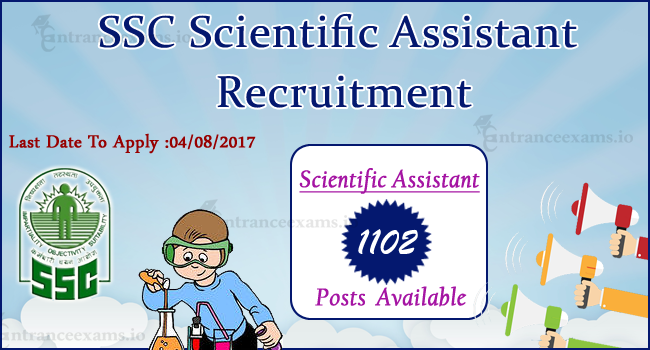 SSC 1102 Scientific Assistant Recruitment 2017 Notification.